Visit my new blog inspired by the Autobiography of a Yogi and find there inspiration and courage for the years to come as our world and our nation struggles against the rising tide of conflict and rebellion. The Devil Made Me Do It? Someone's gotta be blamed! At a class the other night that I gave on the basic precepts of yoga and Self-realization, I pointed out that no true spiritual teaching can omit addressing the question of "Who is responsible for evil; for ignorance; for suffering?" In a few days we honor the life of Martin Luther King, Jr. Each year, Ananda Seattle presents a tribute program (this year, 2016 will be the 14th year!). We combined the tribute to Dr. King with Mahatma Gandhi. We add music and audio-video clips for an inspiring program that is updated and re-scripted almost every year. Most people are practical and don't give much thought to the "big questions" like suffering, evil and ignorance. "Sufficient unto the day is the evil (the problems) thereof," said Jesus Christ! Why bother our little heads about these things -- as my mother more or less said to me when, as a child, I would pester her with questions. We all have our problems; we all die eventually. End of story. Get over it! Well, I like this kind of pragmatism too, but my little head has a mind of its own! So I snuffle around the cosmic forest like a pig looking for truffles! And why not? You don't have to be consciously spiritual to see the value in using will power and having hope. Even if we fail, such attitudes are help build strength and character, regardless of outward success. Paramhansa Yogananda was not the first saint to say, in effect, "A saint is a sinner who never gave up!" Or, as more than one Christian saint put it, "A sad saint is a sad saint, indeed!" But, all well and good, but can we really understand with our minds this issue of suffering? It's all academic until it's not: which means, when WE suffer (or someone close to us). Suffering and evil challenge especially the faithful in our (seemingly) nauseating cheeriness and faith in the goodness of God and the rightness of all things, including the "bad" things that happen to "good" people. Do we tell the victims of racism and to the loved ones whose child or father has been lynched or shot for no other reason than the color of his skin that "It's all for the best?" I hope to God, not! I heard Larry King interview Maharishi Mahesh Yogi right after the fall of the Twin Towers in New York city on September 11, 2001. I hope I only offend a few of you, but I was aghast to hear his highness' squeaky voice explain the law of karma on T.V. at such a time of grieving. No doubt he meant well, but, egad, I can never imagine my teacher, Swami Kriyananda, nor yet the great yogi, Paramhansa Yogananda, responding with anything but compassion at such a time. We do need, however, to step back from the human drama if we are see the cosmic drama and have an impersonal insight into suffering, evil and ignorance. The birth, life, and death of stars and planets, and the "eat or be eaten" law of survival among animals are generally accepted by us as a part of the ups and downs of the cosmos. A tiger eats for food and because she's a tiger doing what tigers do. She's not a murderer. But why are there "bad" people anyway? And why do "good" people suffer? Selfishness, self-protectiveness, ego affirmation: these have a natural appeal in a world of struggle and uncertainty. That the golden rule is transparently a better way to live is evidently not as transparent as some of us would think. When the light of a greater awareness that includes the needs and feelings of others and of the world of nature is so dimmed that only threatening silhouette shapes of strife, competition, and opportunity can be seen, "golden rule" becomes "What's in it for me?" We are conditioned by the struggle of life to either recoil in self-defense and aggression or expand in cooperation and harmony. Either way, we are still "we." Our only option lies in which direction we choose. Materialism is that choice that puts the needs of ego (and body) first and the needs of all others second (or not at all). Spirituality is that choice which finds nourishment and protection in peace and harmony. The broader our reality the more strength and stability we have. "Love thy neighbor AS thy Self." By contrast, imagine trying to live in a world where animals and other humans compete for survival. Few would last weeks or even days. The law of conservation of energy says that energy cannot be destroyed: it only changes from one form to another. Applied to a higher reality, the world of consciousness, this offers some interesting parallels to various teachings that we humans have a soul. Our soul inhabits, for a time, a body, and then moves on to another state or body. Energy, not matter and not our body, is our more essential nature. It has no limiting form and thus shares reality with all others as equals. We cheerful and ever positive yogis (and others) drink our cheerful "spirits" from the comfort, support and wellspring of inner silence. It is easier to face death or cope with grief or suffering when our life is lived calmly from our own center where we are relatively free from the hypnosis that our body and personality is our reality. Knowing that suffering, old age and death comes to all, and finding within ourselves "the kingdom of heaven," it becomes gradually easier to experience the pleasures and pains, the successes and failures that are inevitable in life as passing stages or states of mind. But, this detachment from our ego and body DOES NOT (or should not) induce indifference or aloofness towards the sufferings of others. Else, why do Buddhists, and people everywhere, especially the saints, feel such compassion for others even as they, themselves, endure what for many would be an unthinkably self-sacrificing life? When I am less concerned about ME (and how people treat ME or view ME), I am free to be more loving, interested, and compassionate towards others. I have nothing to lose, for the I AM is not the little "i." This is, in effect, the secret of the power of Dr. King and Gandhi. You and I don't need to be bookmarked in the pages of history for our great deeds for humanity because "sufficient unto the day" are our stresses, pains, betrayals and hurts. Everyone's path to greater awareness is unique. The outer forms of our struggles and our efforts is secondary to how we handle them. In the lives of each of these men, their invisible source of courage and inspiration came from a powerful practice of prayer, faith, and meditation. Yes, they had a destiny and role to play. But they each struggled with the energy, will, confidence and endurance to fulfill their roles. Just as you and I do. Their source, their wellspring of the healing waters of peace is as available to us as it was to them. Yes, we can blame God for creating this universe and for putting into motion the necessary dualities of dark and light, positive and negative, good and evil, male and female polarities which, because always in flux, must necessarily alternate on the stage of history, life and consciousness. It is necessary in order for this "mechanism" -- the illusion of the world -- to be created and sustained: it's akin to the quick "now you see it, now you don't" hand of the cosmic magician. This magic "hand" never seems to stop moving. Panthe Re: all is flux! But for having written the play; for running the reel of the movie from the beam of light projected from the booth of eternity, God is untouched by good or evil. God is no more evil than Shakespeare for having created the villain of the play. Good and evil are the necessary characters in the drama if it is to seem real, even to (indeed, especially to) the actors. Those actors who mistake their on stage role for who they are get type cast as B grade actors. Those who play their roles with vim and vigor, always present to the reality of who they really are inside, become the greats of all time. The impulse to "play" has its source in God's "impulse" to create the dream of creation. Just as we dream unwittingly (rarely lucidly), so God's bliss instinctively projects out from its Joy the waves of creation which, endowed with an echoing impulse and innate pure joy, begins to intelligently create and reproduce....all while the seed, the germ, of divine intelligence and motivation silently hides and guides from the still heart of all motion. As forms become more self-aware, this impulse becomes increasingly personal and increasingly forgetful (in fact, even disdainful) of the invisible reality that it is, in truth, a spark of the infinite reality. Bit by bit, both in the macrocosm of satanic consciousness and in the microcosm of human consciousness, the process of separation and rebellion creates a veil and the divine light becomes progressively dimmed. But it is always there even if the darkness of evil or ignorance cannot or will not recognize it. Nothing and no one is ultimately separate from God. But it is we, individually, who must, like the prodigal son, decide to turn away from our separation to return home to the light. We do this because we have suffered the famine of separation and the pangs of the unceasing monotony of duality. Thus suffering, though inextricably embedded in the cosmos and in our separated consciousness, has a divine role also: to eventually guide us toward the transcendent state at the center of the opposites. While we can't truly appreciate the "Why" God created this universe (that has given us so many so many temptations and troubles), we can know that, apart from God's initial impulse, we have made countless decisions to "play" in the tar baby of duality. It is up to us to decide to get off the wheel of samsara (suffering). As we have lived and played for untold lifetimes, so we must accept that escape isn't going to be easy or immediate. We have to pay our dues. God descends into the human drama through those avatars (saints) who have become his "sons" (who by the self-effort of previous lives attracted His grace until they achieved soul freedom). They are His messengers and they come in every age and time to awaken souls who are ready to "come follow Me (home)." This is the great drama of life whose meaning is, simply, that it IS a drama (and nothing else). So, go ahead and blame God but don't stop there in self pity. Pick yourself up and do the needful to improve, to transcend ego, to seek the help of one who knows the "Way," and to offer help, as you can, to others. No more sniveling about your troubles. We all have troubles. Lots of people have more troubles than you. Let's get up, stand up, support one another. Act with courage and fortitude, hope and will power. No act of sincere seeking and openness to the One who is "One with All" will be unrewarded. Faith, hope and charity. Meditation is the single most direct and efficient path to the state of consciousness in which knowing is believing. [[ERRATA]] : My apologies: I mixed two quotes from Martin Luther King in my original blog. It was violence that he described as "immoral." In a paper he wrote in 1950 he described atheism as shown below. Agnosticism I can relate to, at least on the basis that an honest (if simplistic) assessment of human realities can find no sensory evidence of the Deity. To say, therefore, “I don’t know” is to leave open the possibility rather than to join the ranks of dogmatists, both atheists and religionists in hotly declaring a belief or nonbelief in a reality that neither can prove nor disprove to the other. My impression of at least some self-declared atheists is that they object to the depiction of a personal and vindictive God foisted on us by dyed-in-the-wool believers. If you can re-direct the atheist’s attention to the beauties of nature, the vastness and awe-inspiring complexities and antiquity of creation, the gift of human love, charity, and self-sacrifice, you will sometimes find a closet deist who worships the Unseen Hand by another name or form. I don’t mean to paint all atheists with the same brush, but in my experience this depiction describes some, perhaps many — those aghast or traumatized by the atrocities or hypocrisy of orthodox religionists. Science may be devoid of faith or feeling but scientists are not. Too many are the Deist reflections of Albert Einstein, for example, for anyone to insist that the greatest scientists lack feeling, reverence or awe in contemplation of the mysteries of life and the natural world. Paramhansa Yogananda, renowned author of “Autobiography of a Yogi,” came to live in the United States from India in 1920. He admired the material progress, genius, and good works of western scientists and, as if applying their methods to solving the riddle of human existence, asked for what purpose are we impelled to survive? That we seek to survive is far too obvious to question. But why? What is it we seek? And by what means do we find success and by what means do we fail? His inquiry into the mystery of our existence proceeded, like that of men and women of science, from observation and measurement, not from a priori declarations of absolute or revealed truth. At this point in human history we’ve yet to find life forms such as ourselves from other planets but given the estimate of 200 billion galaxies, I must supposed that the odds are greater than 100% that they must exist. But inasmuch as that inquiry must remain, for now, only speculative, let us turn to the human experience, then, for our inquiry. The ancient scriptures of India admit that “God cannot be proved.” So, let us also take from them this admission and follow Jesus’ advice and Yogananda’s line of inquiry for the Holy Grail. Yogananda started with the observation that what all men seek is happiness. Pleasure, yes, too, but that is easily experienced as fleeting and even counterproductive to lasting happiness as sensory indulgence, unless held in check, can destroy health and happiness. Held even in check, pleasure, moreover, is fleeting and even in its midst a reflective person feels its unreality (because based in perception and anticipation) and its limited span of fulfillment. Observation of human pleasure reveals that its pursuit can be addictive and overtake the good judgment, common sense, and human values of its votaries. Disease, harmful emotions, and premature aging await those who fall victim to the pursuit of pleasure as the summum bonum of life’s existence. Human happiness is usually sought and seen in human love, cherished family ties, financial success and security, prestige, position, fame, talent, or beauty. But these are like prostitutes: loyal to no one. Observation of the facts easily discloses that those who achieve one or more such pinnacles of human happiness too often find the summit to be cold, windy, desolate, dull, fleeting or elusive. At the top there is nowhere to go but down and furiously scrambling up the mountain sides just below you are hordes of competitors and unseen snipers of death, disease, or betrayal lurking in the shadows below. None of these easily observable realities and shortcomings of pleasure or human happiness seem to deter the billions of human beings on this planet from seeking their elusive gains. Perhaps it is lack of wisdom, lack of refinement of feeling, lack of the knowledge of a viable alternative or the hypnosis of the allure of these achievements that blind mankind to our own greater potential for true happiness. Never mind the question of how did this all come about and why. Never mind the fact that the created universe veritably shouts the existence of an overarching Intelligence and Purpose and that the odds of all of this coming into existence randomly is patently absurd, or that the question of the existence of Consciousness belies our very inquiry into it. Each person can experiment as scientifically as the armies of white lab-coated technicians and their test tubes on what brings them true, lasting and satisfying happiness and contentment. Never mind the cosmos, for now. It seems to get along fine without us. It is not difficult to discover for oneself that a selfish life is shortsighted and brings unhappiness and pain. An unselfish life, applied with common sense and balance, brings harmony and satisfaction. Heroes show themselves willing to give their lives that others may live free. Humanitarians, great leaders and reformers, and saints in all lands show that the way to inner peace and contentment is to live for high ideals and for the greatest good of all. The calm, inward gaze away from material objects and toward the intangible but life sustaining gifts of wisdom, compassion, creativity, selflessness, and devotion to the Creator are proof positive against the ceaseless flux of changing customs, conquerors, disease, war, and hatred. Life goes on, as Gandhi and King would often put it, and proves that death, disease, and destruction cannot prevail. How do these self-discoveries relate, then, to the existence of God? Take the journey and see for yourself. But along the way consider those whose lives you are following in your experiments with truth (living an unselfish life). What do these heroes and heroines say? If what the great ones teach us is so obvious, why do so few take the higher path? The higher path requires climbing the mountain and going through the brambles of habit, upbringing, and the ego’s insistence that the body and personality must be satisfied first lest by unselfishness they suffer. And suffer they will, if we listen to them. Moreover, the selfish life also calls to us, both from our dark past and from the sheer magnetism and allure of its fleeting or dark satisfactions. The great scourge of human happiness is addiction to sense satisfactions, enabled and empowered especially by the power of wealth, possessions, and influence. To paraphrase Paramhansa Yogananda and a vision he had of Divine Mother, “Dance of life and dance of death, know that these come from Me.” Fear not for they have no lasting reality for Spirit to Spirit goes, unfettered by matter’s ceaseless flux from form to energy and energy back to form. Let us return then to Martin Luther King, Jr. and his labeling of atheism as unsound and impractical. I cannot claim to know his thoughts in this statement, but I believe his thoughts derive from the loss of the polestar of higher Self from which to guide one’s life. During his brief life (‘50’s and ‘60’s) post-war materialism and atheism (and the power and threat of communism based upon both), existentialism, together with amateurish interpretations of scientific discoveries and speculations such as chaos theory and relativity, were associated with what would be seen as the breakdown of morality and the rise of atheism and belief in the meaninglessness of life. Atheism as a rejection of religious dogmas was not yet widely understood. King lived in a time of rebellion, both positive and negative. Thus Martin Luther King, Jr. both devout and deeply religious (in a nonsectarian way) and a deep thinker concerned with the trends of modern culture, would describe atheism as unsound. It may well be that an atheist turns to the enlightenment of reason but as there are “no atheists in fox holes,” an atheist who holds fast and true to humanist ideals in the face of personal suffering, conflict, betrayal, humiliation or self-sacrifice is something much more than a mere atheist. Such virtue would not, in my opinion, derive from atheism but from a deeper and intuitive sense of justice and righteousness that no mere non-belief in a deity could suffice to sustain. Well, that’s my opinion. Taking this further, then, loss of moral judgment would not be a far step from one whose only anchor was this lack of a belief. As studies have shown that those with a strong and abiding faith heal from surgery or illness faster, and cope with dying with greater aplomb, faith in God is already showing itself (using scientific methods of observation) to be practical. Faith-based communities, too, often show themselves effectively serving the ideals and good of society in ways no legislation or taxation could possibly achieve. None of this is for the purpose of convincing a self-described atheist or agnostic to “come over to the other side.” Such a journey is like a river that runs silent and runs deep. But the impracticality of such a position, and its potential to lead to selfish behavior, productive of unhappiness, is surely worthy of consideration. The words of Martin Luther King, Jr. are certainly worth pondering. January 21, 2013 is the thirteenth year that Ananda in Seattle has presented a tribute to these two great men. We combine excerpts from their talks, writings, and biographies with the music of Ananda (written by Ananda’s founder, Swami Kriyananda). This program is free and begins at 7 p.m. at the East West Bookshop in Seattle (www.eastwestbookshop.com). We are planning to stream it live at www.ustream.com (search on AnandaSeattle on or around 7 p.m., Monday night). Most people are generally familiar with their lives. This tribute to King and Gandhi emphasizes not so much their biographical facts or accomplishments but the spiritual foundation for their courage and inspiration. This aspect is often ignored or only given passing acknowledgement in community programs, books and documentaries. The public inauguration of President Obama takes place on the day set aside for commemorating Martin Luther King, Jr. and the President has announced that he will take the oath placing his left hand upon two Bibles: one owned by Abraham Lincoln and the other owned by Martin Luther King, Jr. This year our tribute includes a segment of Lincoln’s Second Inaugural address, a short time before his assassination. I would like, therefore, to include Lincoln in my thoughts here. There are many books on Abraham Lincoln but one of particular interest to me is Elton Trueblood’s, “Abraham Lincoln: Lessons in Spiritual Leadership.” This book seeks to reveal the spiritual life of a man otherwise an enigma even to his closest associates. But it is clear from this book, and so many others, that Lincoln wrapped his deep and personal relationship to God in a combination of humor and humility. The courageous acts he took were not born of pride or bluster but were weighed in the crucible of intense self-examination, painstaking attention to their impacts upon others, the highest interests of the nation as a whole, the framework of the U.S. Constitution, the duties of the presidency and the highest standards of ethics and idealism. All of these facets he looked to as indicators of God’s will. He offered up his deliberations for Divine guidance in the inner silence of his meditations. Lincoln trembled at the prospect of his own vulnerability to pride or ego and to the ease with which one could mistake guidance with desire, or subconscious prejudices. Abraham Lincoln’s life of faith was rooted in humility and openness to a wisdom far greater than any man might hope to possess or confidently express. But this is precisely the entry fee for intuitive, divine guidance. The evolution of Lincoln’s decisions and policies during the Civil War reveal, in retrospect, the unfoldment of inspiration, calmness, and courage given to him as a divine grace and born of inner guidance. True prophets are keenly aware of their human shortcomings and their potential for self-delusion, more so in the glare of public acclaim or condemnation and more so on the cusp of decisions that can affect the lives of millions and change the course of history. Such examples, then, teach us that from caution and calmness spring the full measure of confidence and courage if born of true, spiritual insight and wisdom. Martin Luther King, Jr. was thrown into his first civil rights campaign in Montgomery, Alabama by what could only be described as casual circumstances, aka divine destiny. In the mix of those who responded to the black community’s response to the arrest of Rosa Parks, people turned to King on the spot, with no prior background or planning. King showed that inner tentativeness and self-questioning which is like fertile soil from whence a seed sprouts and grows to a magnificent tree. This fertile soil knows that it must wait for the rain of divine guidance to prompt its emergence. King, like Gandhi, held strictly to the call of divine love even while also fighting his self-styled enemies with cunning, with courage, and with intelligent strategic purpose. Both King and Gandhi were highly educated, extremely intelligent and deeply compassionate. They were unquestionably chosen by, and in time acknowledged, a higher Power to serve as an instrument of a higher Purpose. Each accepted their role but only as it unfolded. Often they would hesitate to act or speak if that inner guidance and inspiration failed to materialize. The actions of prophets always confound supporters and enemies alike. King’s seemingly sudden interest in and opposition to the Vietnam War, for example, caused consternation among his peers and followers and earned the antipathy and opprobrium of the Johnson administration. Gandhi’s efforts to reassure the Moslem people of India of their place in the rising sun of a new Indian nation outraged Indian nationalists and ultimately was the cause of his assassination. At the same time there exists the paradox that the realization by the prophet of his God-given role and responsibility clashes with his frail humanity and causes feelings of burdensomeness and even periods of discouragement and depression. In each of these three men: this “melancholy” is evident in their lives. A more ego-affirming person (image a dictator) would revel in his power and only his subconscious would undermine his egotism in an effort to balance him out. At the end of their lives, especially Gandhi and King, this discouragement and loss of clarity of direction is evident. For Gandhi the communal violence that attended India’s independence and partitioning was, to him, a sign of the failure of his efforts. For King, the impatience of young blacks and their increasing interest in choosing violence over nonviolence, together with fractious in-fighting among civil rights leaders, added to government distrust of King, and lack of progress in his selected campaigns, caused King to doubt himself deeply. Lincoln’s agonies, by contrast, peaked during the losses and setbacks of the civil war. But by the time he was assassinated, he had just won reelection and General Lee had just surrendered. For the first time he felt a quiet sense of contentment. But the work of reconstruction was, he knew, going to be as difficult and, indeed, more complex than the war itself. Moreover, Lincoln had a premonition of his impending death. Nor was it in his nature to revel in victory. Another characteristic of these three great men was the universality of their religious faith. Of the three Lincoln kept his distance from orthodoxy even as he was notably a man of deep and earnest faith and prayer. King and Gandhi were more aligned with specific faiths but each had a view of religion that we, today, would call true spirituality, unfettered by sectarianism. All three men viewed their efforts in two important and expansive ways: as benefiting their entire nation, not just the group of people for whose rights or upon whose side they struggled; and, each saw the benefit of their goals and victories as benefiting all peoples, far beyond their own nation’s borders. Each of them had the vision far into the future of the importance of their ideals and their methods. Though each struggled against foes and self-styled enemies, each courageously expressed respect, friendship, love, and concern for them, whether as individuals or as a group. Lincoln was famous for bringing into his cabinet, administration, and military leadership his competitors. The lives of these three great men are inextricably linked. King, as stated above, saw the civil rights movement as an extension of Lincoln’s emancipation of slavery and preservation of the Union. 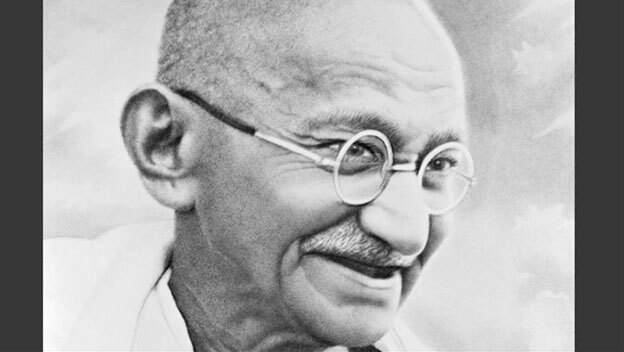 King was deeply inspired by the life and lessons of Mahatma Gandhi. King travelled to India in 1959 and received a hero’s welcome and a reception worthy of a head of state. People of color throughout the world followed King’s work eagerly. King quipped that he thought the Indian press gave more attention to his campaigns than did the white, American press. King saw that Gandhi gave his beliefs the tools and means to elevate love for one’s enemies to a broader level than one to one. Lincoln held national days of prayer and fasting, asking the nation to acknowledge its errors and to make penance to atone for the evils of slavery and war. Although no writer than I know of viewed Lincoln as an advocate of non-violence in the Gandhian sense of this, it is clear from the testimony both of Lincoln and his biographers that he was deeply pained by the necessity to conduct an unwanted but necessary war. There are connections, too, to the work of Ananda and to the life of our preceptor, Paramhansa Yogananda. In the practice of yoga, nonviolence is one of the core precepts that comprise the foundation for meditation and spiritual path and practice of yoga. In addition, Paramhansa Yogananda initiated Mahatma Gandhi into Kriya Yoga and thus created and established a deep and abiding spiritual connection between their two works. Yogananda, when a young man and before coming to the United States in 1920, was approached by Indian revolutionaries to lead them in their fight against the British. Yogananda declined, saying that this was not his work but predicting that India would find freedom through nonviolence during his lifetime. When coming to America in 1920 and becoming a resident (and later a citizen), Yogananda faced numerous instances of racial prejudice as a “colored” man. He spoke passionately about the colonial exploitations of the nations of Asia and Africa, people of color. He viewed World War II as a just war that would be the divine means of throwing off the yoke of colonialism. The power by which these three changed the course of history has its roots in prayer and dedication to doing the will of God, as best as they could perceive it and doing so with faith and humility. Courage, calmness and confidence derive not from ego-affirmation (for the ego is brittle and shallow, for self-involved and easily shattered by life’s many opposing egos) but from aligning one’s self with the Divine Will. Through prayer, meditation and right action, and by the habit of asking and praying deeply for divine guidance, we find the still, silent voice of God guiding us in all that we do. In this we feel divine strength, power and wisdom but at the same time we know that it isn’t ours and that we must “remain awake” at all times. Divine consciousness is eternally awake, omnipresent and omnipotent. Our consciousness, then, must approach the Infinite if we are to partake in the life and spirit of God. This is a tall order but we begin right where we are. Lincoln studied the Bible from an early age and read it daily. King and Gandhi were intimately familiar with the words of their respective scriptures (Bible and Bhagavad Gita) as guidelines for daily life and right action. But it was the habit of meditation that brought each into the Divine Presence. This we, too, can do each and every day. The testimony of the scriptures of east and west affirm that God is present and actively guiding the course of history through those who willing offer their lives to His guidance and will. Our world is changing at an increasingly rapid pace with dangers to life, liberty and health at every turn. God needs willing instruments. Gandhi termed the life he offered to such people Satyagrahis (expressing Satyagraha: dedication to Truth and Purity). Those who are part of the worldwide work of Ananda see this living example in the life of Swami Kriyananda. He has been a spiritual warrior, standing calmly amidst calumny, physical suffering, opposition and seemingly impossible obstacles. His life of dedication to the work of Paramhansa Yogananda has earned for him a state of bliss — the grace bestowed upon those who live for God alone. We don’t start by wanting to be heroes in the eyes of others. We begin, rather with humility and openness to God’s presence and guidance, taking life step-by-step, day-by-day. Meditation, selfless service, and fellowship with others of like mind are essential. Truth is not complex. Let us then be Lightbearers in this world of change, danger, confusion, chaos, and ignorance. See you Monday night at East West Bookshop! Over ten years ago I had the inspiration to create a tribute to Rev. Martin Luther King, Jr. ("MLK") and Mahatma Gandhi ("MG") using quotes from their writings and speeches. It was deeply inspiring to me and has proven to be so to many hundreds who have attended the tribute both here and in Mountain View, CA and other places where it has been presented. The text has changed over the years, partly to keep it fresh and partly to follow new insights. At first it was strictly limited to inspirational quotes drawn equally from MLK and MG. In the last two years we've quoted mostly from MLK in keeping with the national holiday and American interests and have emphasized more of the drama of actual events in MLK's life. There are, however, some salient aspects of their lives that are not commonly emphasized in most public tributes or documentaries. The most important of these is the inner, spiritual life of each of these men. Another is the dynamic relevance their lives, message, motives, and methods hold for the world today. In anticipation of Sunday's presentation and owing to today's official commemoration, I would like to share some of these salient aspects with you in this blog. As revered as both men are throughout the world, we find that it is not necessary to have them be perfect or all together saintly. Their relevance to our own, personal lives comes from the simple but life transforming fact that each aspired to "know, love, and serve God." For each of them, their divine attunement came through serving and giving their lives in the cause of racial, political, and economic freedom and justice. While the public generally is aware of their political victories, most are only dimly aware that each had a deep inner life of prayer from which they sought, received and followed (to their death) divine guidance. It was not that they did not know fear, or were unaware that their actions placed them constantly in danger of assassination and violence. It's that the inner divine sanction they sought and received gave them the comfort and the strength to carry on in spite of their very human shortcomings. What a lesson for each and every one of us. We do not need to be public servants or heroes or martyrs. Unseen by any, we can carry on what is right if we, too, will live for God alone. 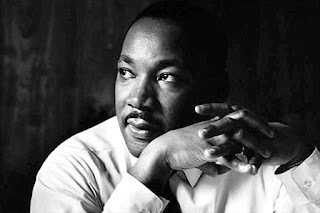 The night before his assassination and in the face of multiple threats to his life, MLK declared that he "had been to the mountaintop" and was not afraid of any man. That it did not matter now, for God had shown him the "promised land." And, while he would yearn for a long life like anyone, that was secondary for he wanted only "to do God's will." In fact, that afternoon, alone and on the verge of despair and despondency for the challenges that faced his work, his life, his family, and his reputation and influence, he prayed and, I believe, had a spiritual experience from the heights of which he spoke those ringing words. Most hearing him then and now believe he was referring to the promised land of desegregation. And who would argue, and why not? But prophets of old and new and scriptures of all lands speak on many levels of meaning. And I, and others, believe that what he was "shown" was far more than that. What he experienced gave him the courage and faith to do what he had to do and to give his life in doing it. Few people know that MLK travelled to India in 1959, after his first victory in Montgomery, Alabama with the now famous bus boycott prompted by Rosa Parks' refusal to give up her seat on the bus to a white passenger who had just boarded. King spoke on All-India Radio urging India to lead the way to universal disarmament (India subsequently did not). Dr. King and Coretta and travelling companions were veritable celebrities in India where the bus boycott had been followed in newspapers throughout India. MLK was more than a southern Baptist preacher. His religious views were liberal, in the most elevated sense of the term. He was more than an eloquent black speaker from the south. He was an intellectual who grappled with the issues of twentieth century western culture and was well read in philosophy, scripture, and history. Had his calling not been towards civil rights his own inclinations would have led him to stay in the north and become a professor, writer and lecturer. In college he felt the presence of God in nature and spent many hours alone, out-of-doors, day and night. MLK was a "disciple" of Mahatma Gandhi who saw that Gandhi resolved what King thought was the gulf between the "love thy neighbor as thy self" teaching of Jesus with the compelling need to fight injustice. MLK said that Jesus gave the teaching of love but Gandhi gave the method to make it applicable to social causes. King followed Gandhi's understanding that resistance was anything but passive. Nonviolent resistance required as much courage, self-sacrifice, and strength as that required in battle for a soldier. MLK like MG was not only assassinated but both felt that their efforts had been unsuccessful: Gandhi, due to the communal rioting that followed the great victory of nonviolent freedom from the British, and King, in the rising militarism of younger, up and coming civil rights leaders. MLK took considerable heat from his anti-war stance on Vietnam. He was harassed by the FBI and Johnson administration and hounded by rivalries among his own civil rights associates. Yet both men, to the end, maintained their faith in God and in the victory of good over evil. Both were practical idealists, eloquent speakers, gifted writers and astute organizers and negotiators. Possessing great will power, yet they were loyal to their own and forgiving to those who betrayed them. Both saw their religion and their politics as applicable to all humanity and for all time. Never did either succumb to sectarianism or nationalism. Mahatma Gandhi was initiated into kriya yoga by Paramhansa Yogananda during Yogananda's one and only return visit to India in 1935-36. Yogananda, prior to leaving India for America in 1920, was asked by revolutionaries to lead the fight against British rule. Yogananda declined saying it was not his to do in that lifetime but that he predicted that India would win its independence by non-violent means: and this was before Gandhi had come onto the political scene in India and had come into his role as leader for Indian independence. An earlier generation black leader for justice in America, W.E.B. Du Bois, invited Gandhi to come to America but Gandhi declined, saying it wasn't his role to do that and India was where he was needed. Du Bois predicated, however, that it would take another Gandhi to end segregation and uplift the American "negroes." How right he was. The world today, and America especially, is in dire need of a voice of moral authority. Our nation seems polarized between extremes and has lost the dignity, compassion, and ideal-inspired reason to see our way clearly to the greatest good for the greatest number. We must find a way to affirm universal values, including spirituality, without sectarianism; to teach, model and encourage balanced, positive, and wholesome values and behaviors without censorship, discrimination, or coercion; to encourage self-initiative and personal responsibility rather than entitlement and victimization. To foster a hunger for knowledge, not mere profit, for sustainability, not indulgence, for cooperation not ruthless competition. The law of survival and happiness is based on one and the same principle: self-sacrifice. Self-sacrifice means the recognition that we are more than we seem and reality is bigger than our individual self. Self-sacrifice is the investment into a longer rhythm of sustainability that brings a wholesome prosperity, harmony with nature and with humanity, and lasting happiness rather than passing pleasure. "Greater love hath no man than to lay down his life for his friends," as the Bible says. Few are called to give their lives for the lives of others, but all of us are called upon to become the "sons of God," meaning to live up to our own highest potential which is far greater than to live for the moment and for the senses and ego gratification. As parents sacrifice for the good of their children (health, education, safety, comfort, and security), as soldiers sacrifice for defense of their country, as great artists and scientists toil to share inspiration and create a better world, so too each of us are called upon to harmonize ourselves in daily life with right diet, exercise, cooperation, compassion, knowledge, community service and wisdom. Such requires moral vigor and personal sacrifice of the desires of the moment for a greater reward. Both Gandhi and King labored to instill these basic and universal values in their followers and to their people. Each understood that no victory over injustice could take place without the moral victory of an honorable, self-respecting, self-sacrificing, balanced, and compassionate life. When and by whom do we see these values held up for honor in America -- not by words, alone -- but by example, by leaders in every field such as arts, entertainment, religion, business, science, and politics? Look at those whose lives we are fascinated by: celebrities whose lives of debauchery echo the lowest common denominator of humanity. Yet there are heroes here and there, and all around us. They don't necessarily shout and conduct public polls. But we need them now just as Dr. King was no less a prophet than those of the Old Testament, no less flawed than any one of us, but willing to give his life to something greater than himself. Ananda's worldwide work is focused upon discipleship to the living presence and precepts of Paramhansa Yogananda. In this respect the example of Ananda may seem irrelevant to the world today. But it is not, for from a tiny seed a mighty oak can grow. We do not practice "Yogananda-ism." Discipleship for Ananda members means to attune ourselves to the truths that he represented, rather than to worship a mere personality. Ananda is anything but a cult, focused inward upon itself. It is no coincidence that Yogananda initiated Gandhi into kriya yoga or that MLK was a "disciple" of Gandhi. The movement towards universally shared values such as "life, liberty, and happiness" and the equality of all souls as children of the Infinite is no cult but a powerful tsunami closing in towards the shoreline of modern society. The destructive aspects of this all consuming tsunami are felt only by those who stand fast in their sectarianism, racial prejudice, bigotry or other narrow-eyed identity. Kriya yoga symbolizes more than a meditation technique. It represents the understanding that each of us must find within our own center these universal values, our conscience, and our happiness. Much more could be said, but I have planted enough dots along the path for others to connect. We celebrate the life of Dr. King because we celebrate the precepts he represented and the example of self-sacrifice that has been all but forgotten in the haze of modern materialism. If America, and other countries, are to survive the challenges we face, we must face them together with a sense of our shared values and essential unity.